It’s important to develop an approach for every interior & client. For rigorous, modern spaces, a fixed look or color that repeats weekly is often best. For historic & traditional interiors, we recommend joyful bouquets of seasonal flowers, delivered weekly in NYC, that become natural focal points. Gabriela Wakeham Floral Design https://www.gabrielawakeham.com a highly rated NYC luxury florist has announced its Fall 2017 offering for NYC weekly flower delivery to corporate and residential clients. The Fall 2017 weekly flower collection includes modern, contemporary, and classic aesthetics. With colder weather on the way and more time spent indoors, weekly delivered flowers can improve the quality of life in any NYC interior environment. The transformational effect of flowers is well known and with Gabriela Wakeham’s better designed luxury flowers the favorable effect is that much greater. There is no doubt that springtime is the peak season for flowers. But each season has its share of elegant blooms for weekly flower delivery in NYC. Because they are less expected, sometimes flowers in an elegant palette of rich autumn hues can be more memorable. The Fall 2017 NYC weekly flower delivery collection from Gabriela Wakeham Floral Design includes many of these fall colors. Deep golden yellow, rich darker orange and a range of elegant, rich browns distinguish this seasonal palette. Sunflowers, dahlias, roses and some orchids are among the blooms found in these distinctive autumn shades, and premium stems of each are featured prominently in Fall 2017 weekly flower delivery in NYC. On the modern end of the floral design spectrum, there are elegant contemporary options for weekly delivered flowers during autumn. Our Fall 2017 signature modern NYC floral arrangement is a stunning twist arrangement of monochromatic deep orange calla lilies. Often referred to as the most regal of flowers, calla lilies exude luxury and simplicity simultaneously. For weekly flower delivery in NYC to quintessentially modern spaces such as galleries, design studios and, architecture firms these callas are sure to be client favorites and win many favorable reviews. Also for the most rigorous modern interiors, classic white orchids, calla lilies, roses and other blooms are available during the fall season an normal. “We operate as a boutique florist and one of the most important aspects to us is getting to know our clients personally,” said Wakeham. “Among our many client groups, often our residential weekly flower delivery clients are the ones we get to know and understand best.” The Fall 2017 collection for weekly flower subscriptions in NYC continues Gabriela Wakeham Floral Design’s tradition of delivering impeccable luxury flowers to fine homes in New York City. From historic brownstones requiring bountiful traditional mixed bouquets, to sleek contemporary architectural spaces indicating modern weekly flower delivery, a range of new fall options are available. Residential designs for NYC weekly flower delivery are often inspired dually by the product portfolio in the company’s online NYC flower shop and the client’s personal aesthetic. Individualized design consultations lead to custom pieces that enhance a home’s interior design. Many times placed at focal points such as entryways, dining tables and on built-in furniture elements, luxury flowers complete each home’s unique look. Color and texture are also important design elements to be considered for weekly delivered flowers in NYC. Whether precise and controlled or more freewheeling with a fresh-from-the-garden look, arranging techniques can create succinct looks. Then with the addition, or absence, of color the design statement can be completed for looks that are memorable and beautiful. As a luxury florist offering weekly flower delivery NYC, Gabriela Wakeham Floral Design individually selects each stem fresh from market every morning. Its designers carefully prep and hand condition each flower before adding it to an arrangement. This method helps flowers be longer lasting, especially when placed and maintained carefully. Only the finest orchids, calla lilies, roses and seasonal flowers are offered. The company’s florists hand craft each arrangement in-house using premium materials and elegant vases. They work in small batches and we know our clients by name. These careful steps help Gabriela Wakeham earn five-star reviews. It wants to build a clientele that is delighted and satisfied with their NYC weekly flower delivery. Gabriela Wakeham offers a range of floral design aesthetics from classic to modern. Its weekly flower delivery in NYC is available everywhere in its service territory: Manhattan, Dumbo, Williamsburg, Long Island City and Brooklyn Heights. New York City’s major business centers are areas of special concentration. As such, the company offers NYC Financial District weekly flower delivery to financial and investment firms located in the Wall Street/Lower Manhattan area. In addition, Midtown weekly flower Delivery, Manhattan, is an area of focus including business hubs near Rockefeller Center, Times Square, the Garment District and Columbus Circle. 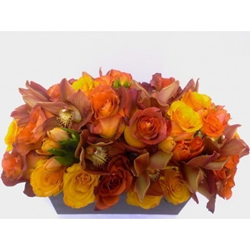 Gabriela Wakeham Floral Design also offers a complete suite of NYC corporate floral services. As described, these include weekly flower delivery to corporate, retail and hospitality sector clients including hotels and restaurants. Event design and event flowers in NYC are another significant portion of its Manhattan corporate flower delivery offering. Its designers have produced events in every major venue in the New York City metro area, and also are available to design exceptional personal celebrations. The commitment to quality is unwavering and it conscientiously sources the best NYC flowers, greens and living sustainable plants. Gabriela Wakeham Floral Design is a high-end local florist delivering in New York City. Founded in Tribeca in 2009, it today delivers luxury flowers in Manhattan as far north as 135th Street, as well as to Williamsburg. Long Island City, Dumbo, Astoria and Brooklyn Heights. While the current service territory has been expanded significantly, the company continues to place an emphasis on its original downtown neighborhoods. It specializes in flower delivery to Tribeca, Soho, Hudson Square, West Village, Wall Street, lower Manhattan, Lower East Side and Battery Park City. With approximately 75 exclusive floral arrangements featured in its online flower shop, Gabriela Wakeham is a leading boutique florist in New York City.